Yamana Gold sells Chapada mine to Lundin for total consideration of over $1 billion. The company doubles the dividend and announces its intentions to buy back stock. The move comes as part of a general trend of focusing on shareholder returns over growth. Yamana Gold (AUY) has just announced major news: the company is selling its Chapada mine to Lundin (OTCPK:LUNMF) for a total consideration of over $1 billion. The news is very material, so let's immediately get to the details of the transaction. Additional cash payments of up to $125 million based on the price of gold over the five-year period from the date of closing. $100 million payment contingent on the development of a pyrite roaster at Chapada by Lundin. 2% net smelter return royalty on gold production from the Suruca deposit. On the other hand, any longer-term investment in gold equities with a time frame of, say, five years hardly makes sense if the investor does not see gold prices over $1,400/oz on a five-year horizon. Thanks to the transaction, the company is going to increase the annual dividend by 100% to $0.04 per share and purchase up to 5% of the outstanding common shares on Toronto Stock Exchange and New York Stock Exchange. At ~$2.50 per share, Yamana Gold will have to spend roughly $120 million. The company finished the fourth quarter with about $100 million of cash, so investors should expect gradual purchases rather than a concentrated buying effort. Besides the dividend, the company plans to increase exploration efforts to deliver organic growth and to prioritize balance sheet improvements. With $1.76 billion of debt at the end of the year 2018, Yamana Gold has rather material leverage, and will certainly feel more comfortable when debt decreases. Yamana's move follows the general trend this year - miners try to reassure investors that they will not bury millions of dollars underground and will prioritize shareholder returns. Previously, IAMGOLD (IAG) announced the decision not to proceed with the construction of Cote Gold project while Eldorado Gold (EGO) decided against building Kisladag mill. The original market reaction to the news is negative. However, I view Yamana's move as a step in the right direction. It is obvious that the industry can no longer rely on die-hard gold bugs to bid gold miners' shares up. The gold price has been trading in a range for too long, and many investors are obviously turning to other sectors in search of growth opportunities. 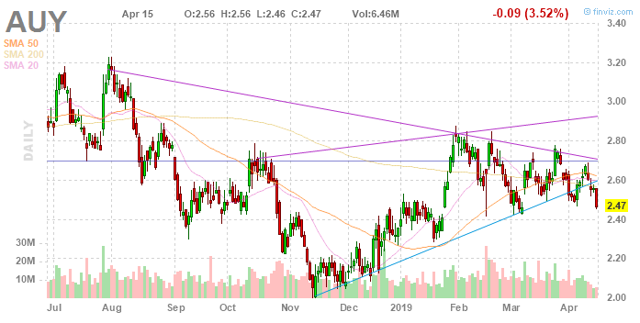 This situation has been exacerbated by gold miners themselves, which, as an industry, have generally been poor stewards of shareholders' capital as evidenced by the stock price charts of many miners. In this situation, the industry needs to focus on shareholder returns, and such a focus implies dividends and stock buybacks. In this light, Yamana Gold's decision is a conceptually correct move. Should the current weakness persist, shares will become increasingly interesting for a speculative rebound play. Disclosure: I/we have no positions in any stocks mentioned, but may initiate a long position in AUY over the next 72 hours. I wrote this article myself, and it expresses my own opinions. I am not receiving compensation for it (other than from Seeking Alpha). I have no business relationship with any company whose stock is mentioned in this article.